There was most definitely not a warm welcome in the valleys for the visit of United to the Liberty Stadium. Swansea had of course inflicted defeat on Louis van Gaal’s team in his first official game in charge at the beginning of the season at Old Trafford. This was a chance for United to gain revenge for that defeat and to consolidate third place in the Premier League. Going into the match the Reds had only suffered one defeat in nineteen matches and were also going well in the FA Cup. The team selected by the manager to return to England with the three points comprised of: De Gea, McNair, Jones, Rojo, Shaw, Herrera, Blind, Di Maria, Fellaini, Rooney and Van Persie. The subs were: Mata, Falcao, Januzaj, Smalling, Young, Valencia and Valdes. Van Gaal tinkered again at the back by making two changes from the side which beat Preston 3-1 in the FA Cup on Monday, Paddy McNair replacing Antonio Valencia at right-back and the fit-again Phil Jones came in for Chris Smalling in the centre of defence. Wayne Rooney started as a striker in the league for the first time since December. 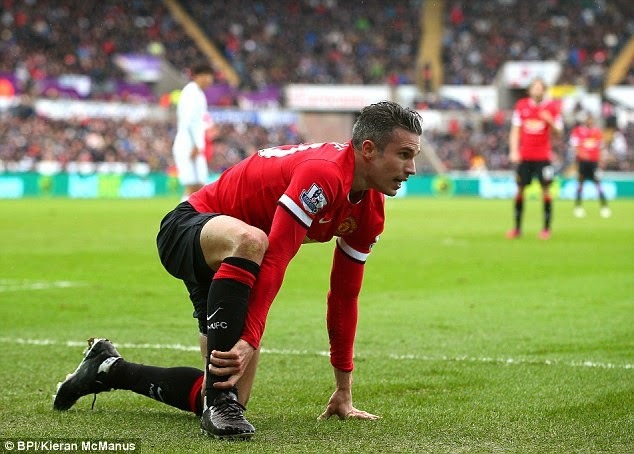 Falcao was left on the bench as Robin van Persie was the preferred choice to partner Rooney up front. As van Gaal had kept the captain in attack there was also a first start since December for Fellaini in midfield. The first half started with an early foul by Fellaini who was either trying to stamp his authority on the game or just plain clumsy. Rojo uncharacteristically gave an early ball away from which Routledge tried his luck, but the Argentinian defender righted his wrong by blocking the shot for a corner. 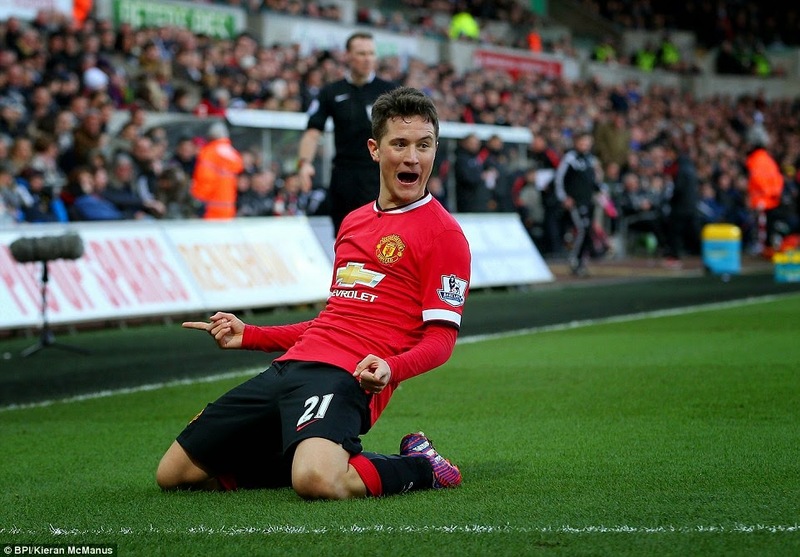 Swansea went close to taking an early lead but Ander Herrera just, and only just, cleared Gomis’s header off the line. That was certainly an early let off for United and a warning for the visitors defence. The stress on the United players started to show as Herrera lost his temper with Paddy McNair as a simple pass to the Irishman went out for a throw-in. It had been a bad start for United, how many times have we seen that this season. 10 minutes into the game there was another corner from Swansea and again poor marking from the visitors which allowed Gomis a free header which he totally wasted by heading over. After patient passing from United, McNair won a free-kick on the right. Angel Di Maria lashed a ball into the middle which fell to van Persie, but the Dutchman fired so wildly from an acute angle that it went out for a throw-in on the other side of the pitch. United’s marking at the back was woeful, as was shown when Jones was nutmegged on the left then as the ball was crossed nobody was picking up Routledge who could only shoot weakly at goal which David de Gea saved easily. Fellaini was walking a fine line with his niggling fouls, something that he had to be careful with. Wayne Rooney started brightly with some fine one touch football around the opposition’s box and nearly latched onto a nice ball at the near post from Di Maria. At the other end, Phil Jones inexplicably gave away a corner, another example of how poor his has performed this season. Too many times this season United’s play forward has been halted by passes that have ended up going backwards which has resulted in mistakes at the back. On 26 minutes Robin van Persie had a good run to the byline and managed a cross which the keeper Fabianski reached before Rooney could get a foot to it, shortly afterward the Dutchman had a run and shot on goal, unfortunately, he sliced high and wide. United finally started to turn the screw and it paid off in the 27th minute with some fantastic approach play down the left involving Fellaini, Shaw, Di Maria and Rooney that saw the ball fall to Ander Herrera who was lurking unmarked inside the penalty area. The Spaniard struck a right-footed shot into the bottom corner. That was his third goal from his last three starts in the side. 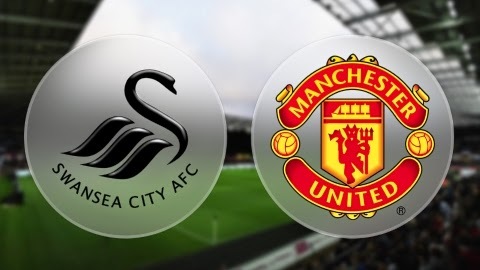 However, the joy didn’t last long as Swansea drew level within a couple of minutes as Ki ended a move by flicking the ball past de Gea far too easily in the six yard area. A soft goal to concede so soon after taking the lead, which was down to a total lack of concentration in United’s back four. 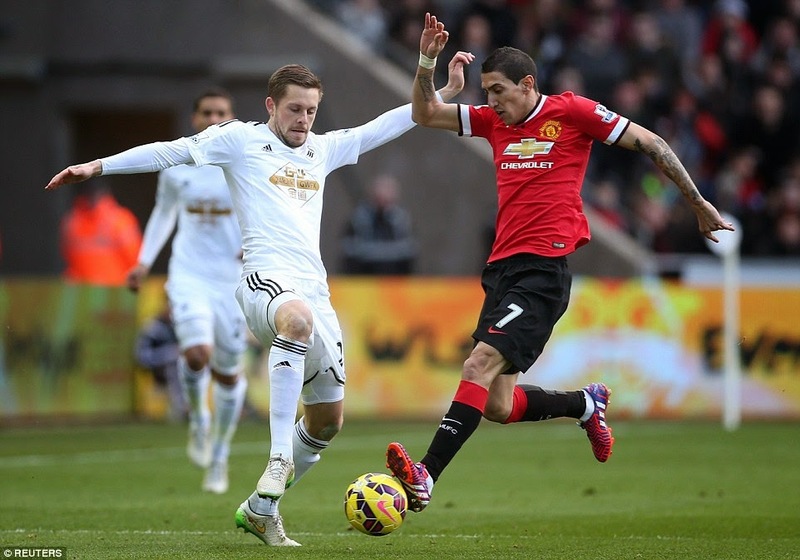 The majority of United’s attacks were coming down the left with Shaw and Di Maria heavily involved in everything. Their endeavours, just before half-time, produced another corner from Rooney, which was played much too close to the keeper again. It should be noted that United have only scored from eleven set pieces all season. 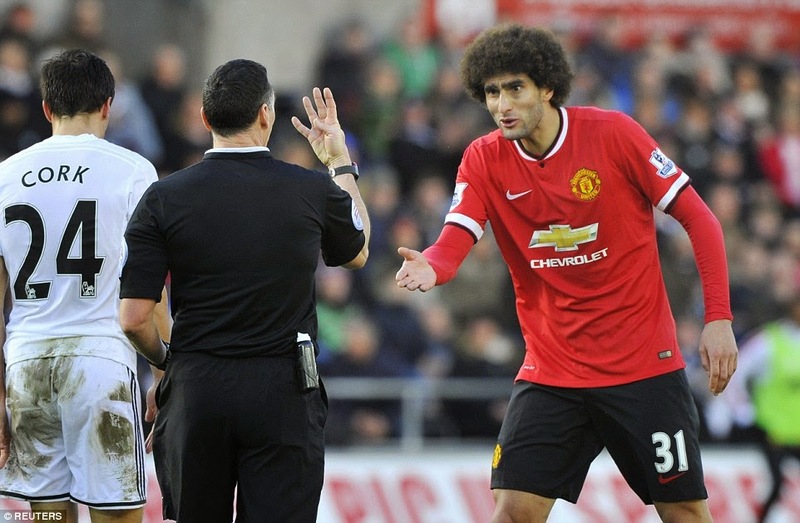 Referee Neil Swarbrick eventually lost his patience with Fellaini, who finally received his yellow card after having conceded four free-kicks. Half-time and it was all square at 1-1. More purpose was to be expected from the Red Devils in the second half. There were some fleeting glimpses of the old partnership between Rooney and van Persie coming together up front but not enough. However, it was good to see the captain back where he belongs. At the beginning of the second half, United’s first change saw Antonio Valencia replace McNair to add pace and experience to the right back position. Phil Jones began the half by picking up an early caution. 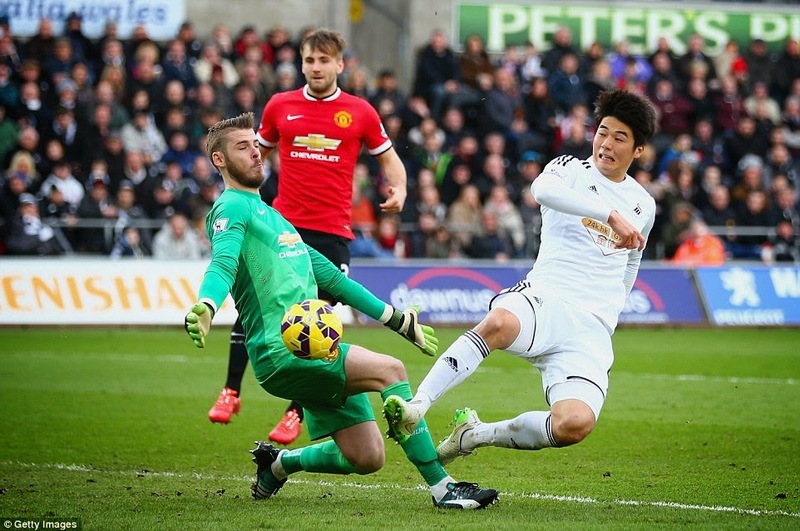 Ki almost grabbed his second from an identical move to Swansea’s equaliser, but this time he was thwarted by de Gea. It was good to see Daley Blind lose his temper with Shaw as that’s exactly what the defence needed, a kick up the backside. If van Gaal was an animated character he would have surely pulled out all his hair after what he was witnessing at the back. A flurry of corners from United didn’t really trouble the home defence as they easily cleared their lines. As the half settled down United once again enjoyed some nice passing moves across the pitch but lacking any penetration. 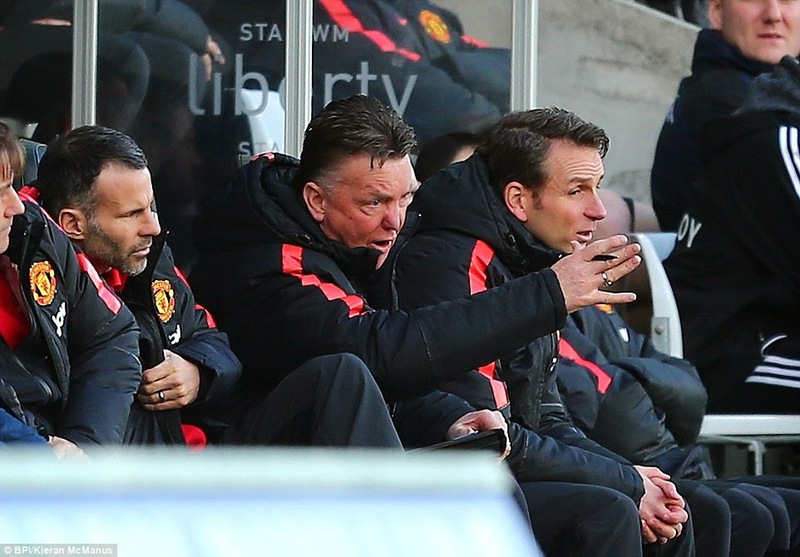 After 58 minutes, van Gaal had seen enough and substituted Luke Shaw for Ashley Young. A positive change which nearly paid off immediately with the subs first touch as he laid the ball into the path of Rooney who in turn touched the ball to van Persie whose shot hit the side netting. You got the feeling that if the Reds could stay strong at the back the game was there for the taking with the speed of Valencia and Young out wide. Young especially was looking lively and putting in some decent crosses from the left. Rojo headed over a corner when he really should have gone closer with his effort. Then a second corner caused confusion in the box as nobody quite knew where the ball was until the keeper dıved on top of it. Van Persie came close after some stunning passing in midfield, but he just couldn’t connect with his volley with any power. With 20 minutes left in the match, United were in total control and were pushing for the winner as the away fans kept up their ’99 Anthem. Rooney had a shot blocked resulting in yet another United corner. Everything was going the visitors way, surely it was only a question of time before they found the breakthrough. Then out of the blue disaster struck as Shelvey found himself unmarked 30 yards out and let fly with a deflected shot that flew past the wrong-footed David de Gea. It’s not good to put the blame on a single player when the opposition score, but in this instance I feel I have to as Fellaini gave the ball away in the center circle and made no effort at all to chase down the ball after his mistake. This is not the first time he has been guilty of this, but at least he didn’t fall to the ground clutching his neck this time. After all their promising work, United found themselves chasing the game, not for the first time this season. United’s last change of the match came after 78 minutes when Di Maria, who had looked jaded in the second half, was replaced by Juan Mata. Ashley Young was booked for what the referee deemed a dangerous challenge after 84 minutes. Fellaini played the last 10 minutes as an out and out striker as van Persie struggled with an injury and as van Gaal had used up his three substitutes he had to struggle on. United’s fourth caution came after Rojo was booked for a debatable challenge on the keeper from a United free-kick in the last few minutes. Every ball forward from United in the last ten minutes of the game was aimed long towards the head of Fellaini which would have pleased Big Sam, but today the tactic didn’t pay off. In the end, United had fallen to their first defeat since the home loss to Southampton, but full credit to Swansea, who have now done the double over United this season. 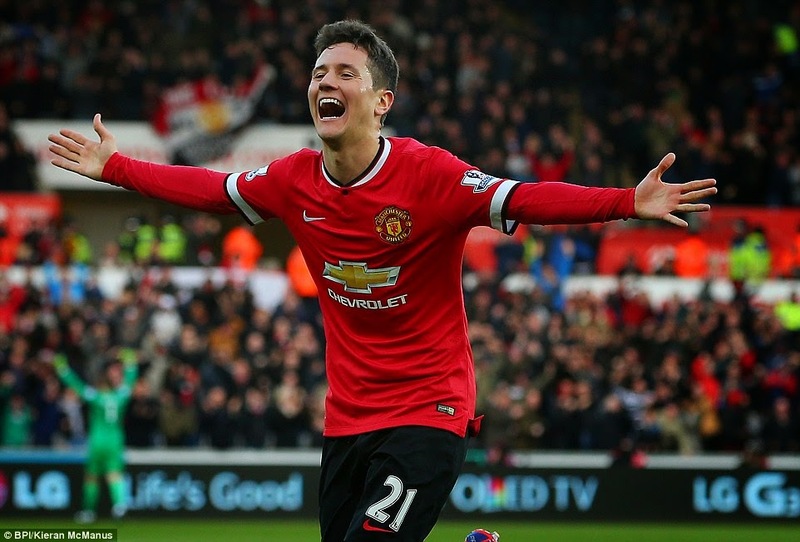 The only positive to be taken from the loss is the man of the match performance of Ander Herrera, who once again fully justified the decision to start him. His clearance off the line in the end was futile, but his goal was well taken. For Manchester United, this was a result which took the wind out of their sails and put more pressure on the challenge of finishing in the top four. Another toothless display from the United forwards who needed to convert the few chances that were created, and rarely did they ever look capable of doing that. With the new philosophy and system being used by Louis van Gaal gone is the swashbuckling attacking style of old which has been replaced by a dour approach play that is far too predictable. Teams are simply not scared of United in the way they used to be, the fear factor has totally disappeared. United desperately need a stable back four with players who can actually defend then we might have a chance at competing for the league again. Next up is the visit to Old Trafford of Sunderland and a chance to put a run of victories together in the push for the Champions League places. It would be a disaster for the club to miss out on the competition for the second year running, but on this performance nothing is guaranteed. It is time for socks and sleeves to be pulled and rolled up collectively by the team. Next Rooney at the double.